The professional design organisation, The American Institute of Graphic Arts(AIGA) has members from all forms of visual communication, from graphich design, typography and interaction to branding, animation and environmental design. AIGA organises two biannual events; the AIGA Design Conference and GAIN: AIGA Design and Business Conference, which are held alternating years. With more than 90 speakers and thousands of attendees, it would be an unforgettable experience for every participant. 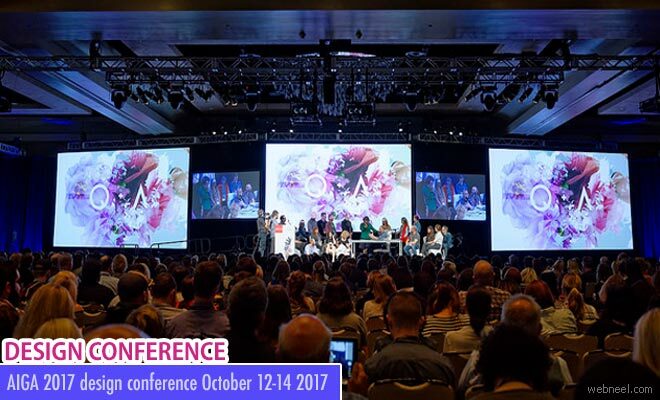 The AIGA design conference is a place to explore design excellence and discuss the issues related to design profession. AIGA has announced a new match program and a scholarship both designed to help in learning and networking in conference. Once registered before the conference, each participant will be notified of their Match with a designer in a category different from their own. Scholarship is an opportunity dedicated to designers in the process of building their businesses, reputations, and brands who could otherwise not attend the conference.